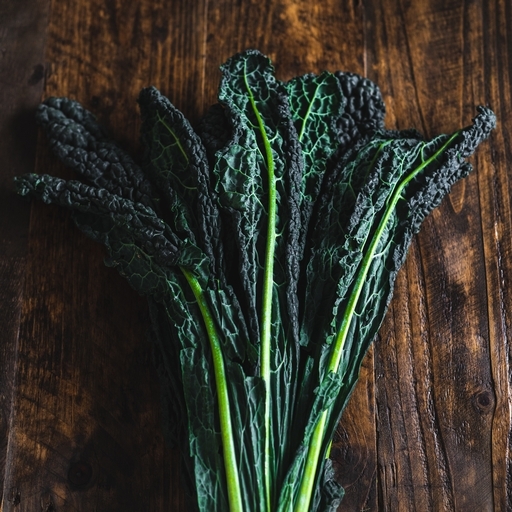 Known as cavolo nero (its origins lie in southern Italy), this variety of kale has dark, beautifully blistered leaves and a good robust texture. Black kale is fantastic in peasant soups, ribollita, risotto and pasta dishes. Or just dress with a chunk of butter, a squeeze of lemon and a bit of pepper. Wash well, trim stalks and use as spinach or cabbage. Cut and add to soups or use in omelettes, potato cakes or stir-fries. Great eaten simply as greens, this one also works well added to hearty soups and can even be added to salads. Cavolo nero has tough ribs. Grip the rib with one hand and with the other, pull the leaf away. When you get to the centre leaves, they’re tender so you can chop these without stripping them. If you’re going to boil greens you need to have quite a big pot with plenty of water and a little salt. Plunge them in and get them boiled quickly. When they have been going for a couple of minutes, take them out and refresh under cold water to stop them cooking. Squeeze out as much of the water as you can with your hands. Cavolo nero goes great with a knob of butter, a squeeze of lemon and a bit of pepper. This kale was traditionally grown in southern Italy, where it got its name, but is now grown in the UK.